We love when our students go out and inspire others in their communities. Case in point is Atiya Goldsmith-Irby. She graduated this year with a bachelor's degree in Business Administration with a concentration in Entrepreneurship/Small Business Management. Atiya was heavily involved in campus activities, honor societies -- she served as president of Peirce's chapter of Delta Mu Delta, Kappa Nu -- and her local community during her time at Peirce. In fact, Atiya even was our Student Commencement Speaker at this year's ceremony! 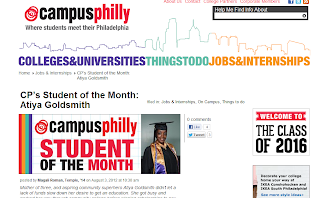 I was excited to see that Campus Philly named Atiya its August Student of the Month. If you're looking for a little inspiration, click over to Atiya's interview to read why she decided to attend Peirce after having three kids, what her ideal job in Philadelphia would be, and why she and her husband decided to create a scholarship for married students. Congratulations Atiya -- be sure to come back and fill us in on what you're doing in the future!